Hey guys! This is Julie, your Service Projects Chair! This is the 3rd K-T Key I have released this year. 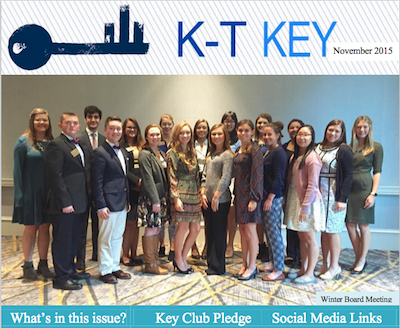 If you still don’t quite know what a “K-T Key” is, it is essentially the district newsletter. Unlike the newsletters that your LTG’s send out that only pertain to the division, the K-T pertains to the WHOLE division! In case you missed the other two, feel free to go on issuu.com/ktkeyclub to see the other 2! I will be posting all the K-T Keys on the K-T website as well as issuu so feel free to choose whichever is easier for you! Thank you guys for all the support and service you provide to your communities and hope you guys have a great holiday and end of the year!! !